Placental abruption happens when the placenta separates prematurely from the uterine wall. It usually occurs in the third trimester, but can occur as early as 20 weeks gestation. Placental abruption occurs in about 1% of pregnancies (1). When this happens, the baby can stop receiving adequate oxygen. A placental abruption is a medical emergency and can become severe very quickly (2). Any signs of placental abruption may require immediate delivery via C-section. If a C-section is delayed, this can cause brain injury to the child. In a normal pregnancy, the placenta remains attached to the uterine wall until the baby is born. During a normal pregnancy, the placenta remains attached to the walls of the uterus until the baby is born. Once the baby is delivered, the placenta will naturally separate and will be expelled from the birth canal. In placental abruption, the placenta separates prematurely from the inner wall of the uterus. It can occur during pregnancy after 20 weeks of gestation (1). However, it usually occurs during labor, when the trauma of contractions causes the placenta to tear. If there is a significant placental abruption, the baby will stop receiving oxygen from the mother. When this occurs, the baby must be delivered right away, usually by emergency C-section. A partial placental abruption can turn severe very quickly, so delivery should occur right away if the baby is at or near term. If the baby is premature, the physician will usually closely monitor the mother and baby and be prepared for a fast C-section delivery should the baby become distressed or the abruption worsen. Maternal hypertension (preeclampsia or high blood pressure). Any amount of bleeding during pregnancy should be documented and assessed by your medical caregiver as soon as possible. Excessive bleeding requires immediate emergency medical attention. Any trauma to the abdomen during pregnancy should be assessed immediately! Caregivers should suspect and act on placental abruption based on risk factors and symptoms described above. A patient with a partial separation must be closely monitored and and delivered emergently if the condition becomes non-reassuring (1). ABC Law Centers was established specifically to handle birth trauma cases, and our attorneys have over 100 years of joint experience in the field of birth trauma litigation. Birth injury cases are often long, complex and emotionally demanding. Beyond our focus on delivering unparalleled legal services, our attorneys and staff work to build close, comforting, and openly communicative relationships with clients. At every step of the litigation process, our small, family-oriented team is there to support you and keep you informed. 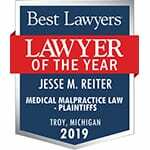 Although we’re based in Detroit, Michigan, we’re equipped to handle these cases in Michigan, Ohio, Tennessee, Texas, Arkansas, Mississippi, Washington, D.C., Pennsylvania, Wisconsin, and other states. The ABC Law Centers birth trauma team has also handled FTCA cases involving military medical malpractice and federally-funded clinics. If your loved one was permanently injured from a preventable or improperly managed placental abruption, we urge you to reach out to our team. We don’t charge any legal fees unless we win your case! Watch a video of Jesse Reiter discussing how a prompt C-section delivery can prevent a baby from experiencing prolonged birth asphyxia and resultant hypoxic-ischemic encephalopathy when obstetrical emergencies – such as a placental abruption – occur.